Michael Cairns owned this well established Gallowgate howff from the 1930s, it stayed in the family until the 1960s. Michael’s son Desmond F Cairns assisted his in the running of the business, Michael Joseph another son occasionally helped out in the bar. In 1949 Michael senior organized a bus run for the staff and customers, this was a popular outing amongst many other pubs in the city, usually on a Sunday when the pubs in Glasgow were closed. 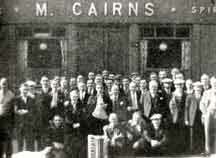 Mr Cairns and the customers went to Fife on this occasion on August of 1949, Kirkcaldy was their centre for the day, where they would play games such as football, the three legged race and sprinting. They had lunch and high tea in the Dunnikier Arms, where Mrs Grace Penman was licensee for many years. The guests of Mr Cairns were looked after by her daughter in-law Mrs Adam Penman, she was a well known variety stage performer in her day, known as Rita Halkett. The following year Desmond was married in Our Lady of Lourdes, Cardonald to Miss Bridie Agnes Mulhern an Irish lass from Breenagh, Co. Donegal. Desmond’s brother Joseph was best man. The history of the pub can be traced back to the 1860s when Robert Clugston a wine & spirit merchant owned the pub, he also owned premises on Howard Street which became known as the Snaffle Bit. William Gardner then took over the pub, he also ran a public house on London Road. In 1878 David Thomson took over the licence, he continued in the pub until the early 1900s. William McGregor Watt took over the business before the First World War, after a long illness his wife had to run the pub, William died in 1920 at his residence 14 Kyle Park, Uddingston. Mrs Norris sold the pub to Alexander Norris in 1926. Mr Norris was a thirty year old manager who ran a shop on Argyle Street, prior to this he managed his mother public house at 180 French Street, Bridgeton. Mr Michael Cairns took over in the 1930s, his son Desmond took over the licence and ran the pub until the 1960s. The other son Michael ran a pub at 63 Shamrock Street at the corner of Garnethill Street. The last owner of Cairns bar was Elizabeth McCormick Callaghan, the pub was finally demolished along with other pubs on the Gallowgate in the early 1970s. This was the result of the City Council’s redevelopment scheme which saw many of our famous Gallowgate landmarks disappear. The customers and staff of Cairns bar, on their way to Ayr. 1950. Desmond F Cairns wedding day with bride Miss Bridie Agnes Mulhern. Bridesmaids were Miss annie teresa Mulhern and Miss Eileen Selina Mulhern, the best man was Desmonds brother Michael. The ceremony was performed by Canon George Galbraith. M.C. 1950. 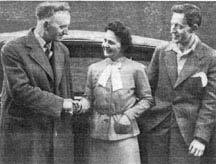 Michael Cairns shaking hands with Mrs Penman and his on the right. 1949.